I watched the live webcast of the Abraham workshop in Phoenix today. Amazing. I feel like I, not so much learned the information, as much as absorbed it. I’ve been listening to Abraham material for quite a while now, but I found this presentation to be very deep and I had a bunch of my questions answered about the nature of reality, consciousness, and the Law of Attraction. I feel like I am still integrating this information into my consciousness; the download is still in progress. A wonderful feeling. Highly recommended. A powerful learning was that the basis of our purpose here, my purpose here, is to seek joy and let the details take care of themselves. Lovely. Permission to enjoy life rather than pay dues to deserve happiness. Just go straight to happy. Let everyone else sort their own stuff out. Just be. Just be joyful. Every chance you get, be joyful. So simple. Jerry Hicks passed away November 18, 2011. He was the husband of Esther Hicks who channels the group of Beings known as Abraham. Read Esther’s wonderful post about it here. Thank you so much for being a relentless question-asker like me. The questions you have asked Abraham through the years have given me many satisfying answers and even more delicious questions yet to ask. I am sure that you have had your questions answered in a wonderful expansive way when you reentered Source and I know you will continue your fun and expansive relationship with both Esther and Abraham. I so much appreciated your physical life and the wonderful physical materials you have provided to help us questioners to discover some interesting answers. I look forward to attending my first Abraham lecture soon and ask them some very delicious questions. Thank you for your joyous receptive nature to allow Abraham to speak through you. I am so very happy that you are wanting to continue this process with Jerry helping you from his Source-filled state. You have helped me so much with my own process of accepting the death process. I have had four members of my family pass over into Source this year and I have been having trouble accepting the absence of their physical form. Thank you for saying that accepting death will help me play better with them in their place of Source. That makes so much sense to me. Thank you for being honest with us in your blog post about being a bit angry with Jerry for not sticking around in the physical world. I also understand this one! When my Grandma passed, all I could hear for days afterwards was her shouting “I’m still here!”. And so is Jerry, but I imagine he might say it a bit differently. 🙂 All my love to you in this time of transformation. My family and I went minigolfing today. I am terrible at it. Really, my three year old was doing a better job than me. 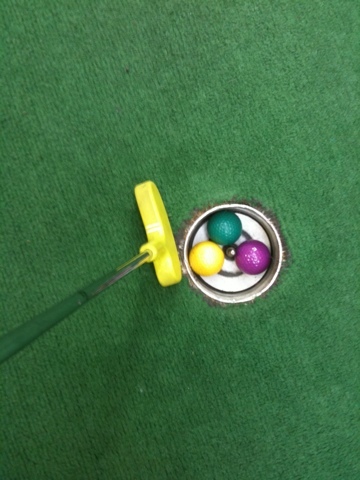 It struck me that minigolfing is a fantastic spiritual training exercise. Most of the time I was clobbering the ball, only to have it bounce right back to me. It is a potent metaphor, too much force and you end up going nowhere. It seems counterintuitive that less focus, less attention and less energy is more productive in achieving our goals. We are taught that if we don’t try really hard and put all of our energy towards our goals then we won’t be successful. It seems a bit lazy to take it easy and just let the Law of Attraction do the heavy lifting. But what if manifesting is just like minigolf? There are three stages to the manifestation process according to Abraham (a group of non-physical beings channelled through a remarkable woman, Esther Hicks): first we ask for what we want, next we allow the Universe to create it, and finally we receive what we want. It is easy to know what you want, and usually it is easy to receive it, but the middle part, the allowing, can be hard. This is the stage where you live your life, often with little sign that anything has changed, and let go of the process of manifestation. You have to stay hopeful and trust that the Universe is lining everything up for you. I think this middle step is a challenge and is where most people get stuck. It requires faith. Faith is one of those messy concepts that fall apart when we examine them too roughly. Faith is fragile, like a champagne glass, and it doesn’t do well under the scientific hammer. But minigolf! That is it! Minigolf is like allowing! We still need to play the game and continue living our lives. Obviously sitting on the side of the course will not help us in the game, or in our manifestation. Manifesting is not about taking no action. Action is important. Too much force is not helpful and neither is facing the wrong direction. We have to be willing partners with the Universe, but we don’t have to do it all. Striving, worrying, impatience, these are all ways that we hit the ball too hard and wonder why we are no closer to the cup. Perhaps Newton was right on the money with the ‘every action has an equal and opposite reaction’ concept. The more we fret, the more we get to fret about. Bills pile up when we want abundance; lovers leave when we want a mate. So it is really about finesse. We line things up, relax, and be gentle with ourselves. We keep moving forward because life keeps urging us on. In minigolf, there is no time for over thinking each shot, because there is a line up of players behind us who also want to have fun. We take shot after shot, we try and try again. Sometimes we get a hole in one, sometimes we hit the water, but we keep going and we keep getting closer to what we want. Relax. You’ve got his one, no need to force it. Play. Participate in the journey. Pay attention. Line things up and hope for the best, the miracle is in the details. Keep going. The universe loves consistent and persistent effort.